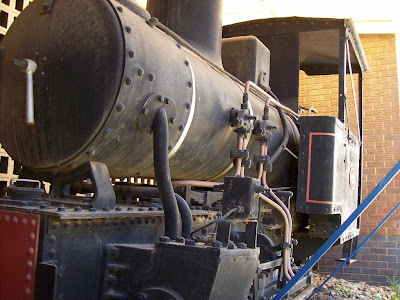 old STEAM LOCOMOTIVES in South Africa: Johannesburg, James Hall Transport Museum, part 3, John Fowler & Co (Leeds) Ltd works # 16129 built 1924. Johannesburg, James Hall Transport Museum, part 3, John Fowler & Co (Leeds) Ltd works # 16129 built 1924. 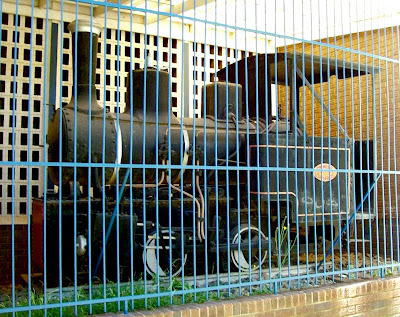 The little locomotive featured below, is on display in the James Hall Transport Museum in Pioneer Park, Wemmer Pan, Johannesburg. See part 1 for more details about the museum. Derek notes that this little locomotive is "in jail"! The 0-4-0WT locomotive is a 2 feet narrow gauge engine, and is a John Fowler & Co (Leeds) Ltd works number 16129 built in 1924. It has a 6.5" diameter cylinder x 12" stroke length design. The 0-4-0WT type indicates that it is a tank engine with the water tank in a well between the wheels. This lowers the centre of gravity point. 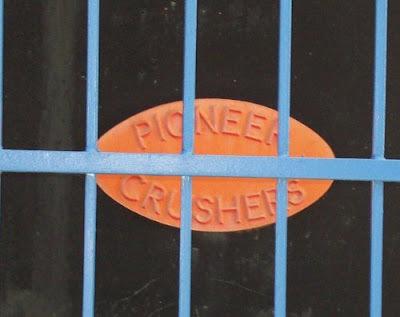 This locomotive is ex Pioneer Crushers Ltd, Langlaagte Stone Quarry where she ended her days of service. Originally she worked on the Durban Corporation (read "Municipality") Shongweni Dam Railway. This, and the next image, were taken years back at James Hall long before the little engine was put into "jail" for its own safety. The brave little Fowler, some time before she was sentenced to imprisonment "for her own protection". This, and the previous image, provided to me in March 2011, are kind courtesy of the photographer, Hannes Paling. Drawings of a John Fowler locomotive which differs a little bit from the one displayed in the museum. Born on 11th July 1826 at Melksham, Wiltshire, John Fowler started work for his father, a wealthy Quaker corn merchant, when he left school, but at the age of 21 he moved to Middlesbrough where he obtained employment as an engineer with Gilkes, Wilson & Company. After some three years with this firm of locomotive builders and colliery equipment engineers Fowler left to found his own business, John Fowler & Company, in 1850. He had considerable success in the design of various types of agricultural machinery and steam engines which were built by several firms including locomotive builders Robert Stephenson & Company of Newcastle-on-Tyne, and Kitson, Thompson & Hewitson of Leeds. William Hewitson (of the last-named firm) joined forces with Fowler to establish the Steam Plough Works at Leathley Road, Leeds, in 1862. It is possible that the construction of rail locomotives - a logical step to widen the range of Fowler products - may be traced to Hewitson although both he (May 1863) and Fowler (December 1864) died before the first one appeared in 1866. The initial orders were for batches of locomotives for Mexico, India and the home market, but subsequently a wide variety of designs were built to "one-off" orders. Not a few were supplied to existing customers, as it was not uncommon for Fowler's to equip a large estate overseas with stationary engines, ploughing engines and traction engines as well as locomotives and all necessary equipment for a railway system. For many years up to the 1914-1918 War, Fowler's production consisted primarily of a mix of these items, and even into the 1930's they were still building steam locomotives and steam road-rollers. However, as far as rail locomotives were concerned, the position had drastically changed. The War had firmly established the internal combustion locomotive, largely through the initiative of the Motor Rail & Tramcar Co Ltd, Bedford. The advantages of this type of machine for lines with light traffic soon became clear, and Fowler's decided to design their own range of standard gauge shunters primarily aimed at the home market. The early models embodied petrol or diesel engines of continental or American manufacture, but it was not long before engines both designed and built by Fowler's appeared. The first internal combustion machine was built in 1923 - an 0-4-0 petrol for the Nelson Corporation Gasworks (Lancs) - and various versions of the basic design were sold until the outbreak or war in 1939; in fact the design was built until recent years, though in small numbers, the later 150hp design predominating. A special narrow gauge design with a central cab was produced in the 1930's and the same general layout was adopted for a large batch of 28/30-ton standard gauge 0-4-0 diesels for the Government (many of which were flameproofed) for use in Royal Ordnance Factories and Army depots. Narrow gauge diesel designs were never produced in large quantities, although several quite powerful locomotives were produced to individual orders. A post-1945 experiment was a narrow gauge locomotive with a standard Marshall tractor engine, but only a few were built. 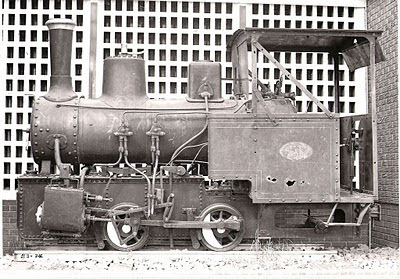 A new standard gauge design was prepared after the War, the standard model being of 150hp, and this continued in production with various modifications until 1968. By 1949 the manufacture of diesel engines was found to be uneconomic and from that time locomotives were fitted with either McLaren, Leyland, Rolls Royce or Cummins prime movers. A further major change in design was made in 1957 when hydraulic transmission (instead of mechanical) was adopted as standard. In the mid-1960's a crucial decision had to be made, and this was brought about by three major factors. Firstly, more shop-floor space was required to meet the ever-growing demand for crawler tractors. Secondly, there was intense competition in the shunting locomotive construction industry, resulting in meagre profit margins. Thirdly, there were clear signs of a permanently reducing demand both at home and overseas. Very reluctantly, it was decided that locomotive building should cease. To ensure the continuation of servicing and the ready supply of spares, the Fowler goodwill, locomotive designs and specifications, and stock of spares, was sold to Andrew Barclay, Sons & Co Ltd, Kilmarnock, early in 1968. The end came on 24th January 1968 when the last locomotive, works number 4220043, a standard gauge 0-4-0 diesel hydraulic, left the works by road for the Cargo Fleet lronworks, Middlesborough, of the South Durham Steel & Iron Co Ltd. This is but a sketchy outline of the Century of Fowler locomotives. Unfortunately, most of the firm's records of early construction have been destroyed but, having heard how their products went to all parts of the globe, I set out to take a look at some to see just how well they have stood the test of time. In England I was on firm ground. The Society's records showed that virtually all of the post-1945 locomotives were still running as well as many of the wartime ones. Most of the early products had survived the War, but these and some of the wartime versions with mechanical gearboxes were scrapped when major repairs became due. A few returned to Fowler's in the 1960's for rebuilding and emerged as modern locomotives with high-speed diesel engines and hydraulic transmission. Unfortunately, from the enthusiast's point of view, none of the limited number of Fowler steam locomotives supplied to this country seems to have survived for any length of time! I remember my first meeting with a Fowler at Cory's Wharf at Erith in 1950. At that time Erith was a great steam centre, with Parish's and BICC operating steam on the narrow gauge, and SIR VINCENT and many other standard gauge locos puffing around. Cory's soon dieselised entirely, but at this time the only diesel they had was No.2 CIRCE (Fowler 19024 of 1930) which I suspect was a little too small for their type of work. However, its copper-capped exhaust chimney made it worth a second glance, and it continued to give good service for several years. Since then I have seen many of the modern versions, but the one that comes to mind the easiest is APCM's 1966 loco at Sewell in Bedfordshire. I have many times climbed the hill at Totternhoe to watch the activity in Rugby Portland Cement's quarry, or trekked across the fields to see the submerged Baguley at Bidwell Clay Pit, near Dunstable. Indeed, Alan Keef had thought of trying to rent the old quarry at Sewell before he managed to talk APCM into letting him drag the Baguley from its watery resting-place for preservation in 1962. As you go to Bidwell you pass the cement works quarry where there has always been quite a selection of locos. Three Fowlers and an elderly "Simplex" trundled the large skips backwards and forwards to the excavators; as the quarry increased in size more powerful locos were needed and two Rustons were bought in 1958. But as I looked down into a completely transformed Sewell quarry in 1967, I saw that for their latest loco APCM had reverted to Fowler's, as witness the gleaming yellow machine outside the brand new loco shed. So far as large numbers of Fowler locos in one place are concerned, I regret I have not been able to visit Fiji. Anyone who has read Balloon Stacks and Sugar Cane cannot help but be fired with enthusiasm for the solid Fowler tanks that hauled the countless loads of cane along the coasts to the mills of Fiji. And this is the spirit that has surrounded Fowler steam locos that I have seen. Solid, dependable locos that have continued to serve their owners in far-off countries around the world for many years. 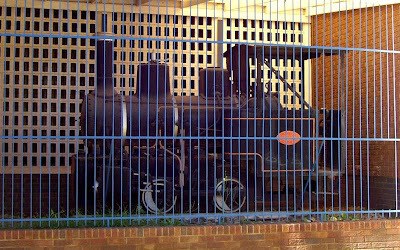 The first Fowler steam loco that I saw was in South Africa, when I was working near Johannesburg. 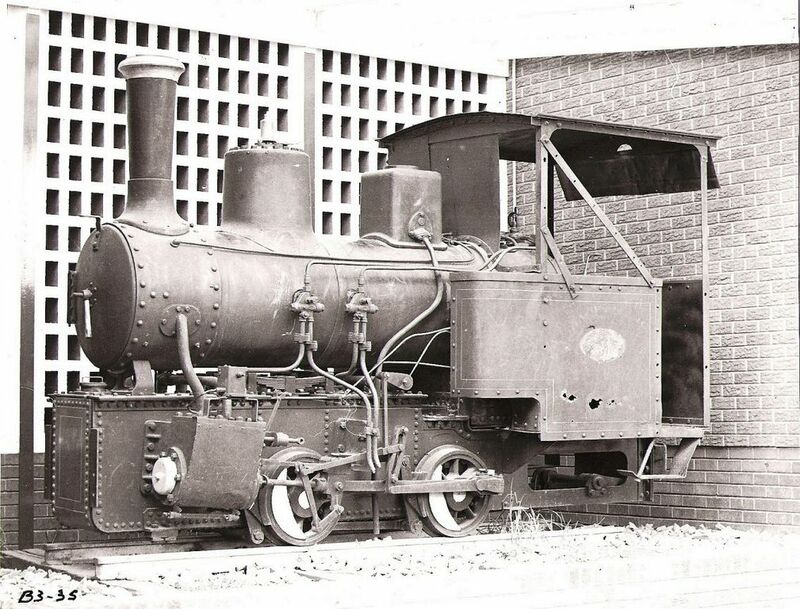 In the past quite a number of narrow gauge steam locos were used at the various mines out there, but closures and amalgamations eliminated most. Just a few stay on as toys to run children's specials at Christmas - the weather is a little kinder at that time of the year than in England! One of these is a Fowler, acquired a few years ago from Natal Estates Ltd, but the loco I have in mind was located behind one of the many mine dumps in a rather derelict and woebegone condition. I thought it would find its way to the scrapheap, but it was not to be. 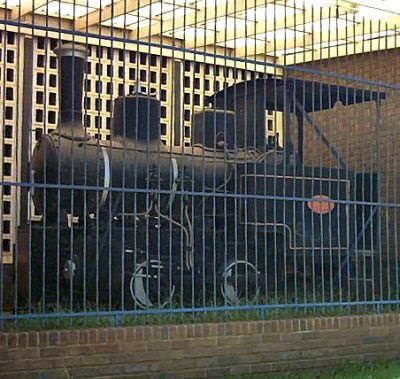 The energetic founder of the Johannesburg City Transport Museum talked the owners into donating it, and after receiving a nice coat of paint it now stands outside the Museum in company with a growing collection of other steam equipment. The story of the other Fowler steam locos at work in recent years in South Africa has been told in my article in RECORD 11, "No Steam at Mount Edgecombe". But undoubtedly one of Fowler's best customers in Africa was Sena Sugar Estates Ltd. This company was formed in 1920 to take over three sugar estates already established along the lower reaches of the Zambesi river in Moçambique. Large areas were cultivated and Fowler's supplied ploughing engines and stationary engines as well as a number of locos. "Fowler" and "sugar" seem to go together. In Kenya I heard of a sugar mill in Uganda where steam locos were in use - "not proper locomotives you understand; just small ones with spark arresters". But, alas, I was not to see them in operation, for though I had a colourful journey through the fine East African scenery, the rail equipment of the Uganda Sugar Estates Ltd was piled in a sorry mess beside the mill workshops. Fowler's had supplied at least two steam and two diesel locos, but road transport had taken over. In Pakistan, however, it was another story entirely. Ever on the lookout for news of out-of-the-way railways, I was nevertheless surprised to hear in Karachi of a little railway in the forest of Changa Manga - and even more surprised when my friend in Lahore showed me pictures of the line with passenger coaches trailing behind trim steam locos. One Sunday I rode the "Changa Manga Express", unfortunately behind a diesel, but the pride of the line was undoubtedly its two Fowler 0-6-0 well tanks. Spotless, like all other locos in Pakistan, they do the workaday jobs of the line in hauling timber from the forest to the sawmill. Only occasionally do they work the Sunday specials. The Indian Forestry Department had other Fowlers, but I was not lucky enough to find them. However, at least one Fowler well tank still works at a sugar mill in India, and there are probably more. 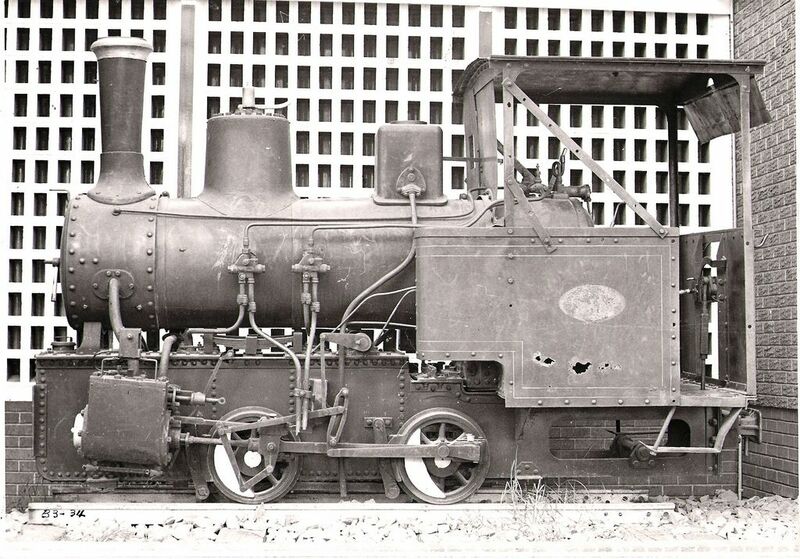 Until fairly recent years a Fowler 0-6-2 tank worked on the 2ft 6in gauge State lines in Gujerat, but it has been replaced. India also had some trim 0-8-0 side tanks which were used in building a water pipeline to Bombay, but I do not know what happened to these. Australia had Fowlers by the score, many of them going to the sugar estates in Queensland where some are still at work. I would like to see more written on these, and perhaps some Australian enthusiast can oblige. Tasmania had some for its Tullah Tramway, and New Zealand boasted quite a few. In fact one still runs in Otago, New Zealand, where a preservation society operates a line along the shore. There were Fowlers in Mexico and Egypt, and many other countries, but enough has been said to give some idea of the tradition behind the name. 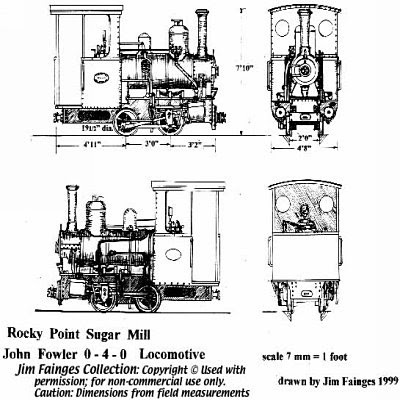 John Fowler & Company were never large scale producers, but aimed to sell a quality locomotive to individual order, with the large variety of designs that course entailed. A tribute to design and workmanship needs no more than to say that many locos lasted for fifty years and many are still going strong, having survived newer locos. The diesels have yet to match this longevity, but the Fowlers in use today will no doubt be with us for some time yet. (Acknowledgements are due to Mr F. Turner, onetime Local Director of John Fowler & Co (Leeds) Ltd, for providing information on the firm's history and also two official photographs. As a follow-up to this article we hope to publish shortly a list of Fowler steam locomotives. Thanks to Alan Duke's researches we have details of many of the earlier dispatches, but the list is by no means complete. In order that it may be as comprehensive as possible we would ask readers having information on Fowler locomotives (additional to those recorded in our Pocket Books), and particularly those delivered overseas, to write to us. We would also welcome any photographs (official or otherwise) to use as illustrations. - Hon. Eds.